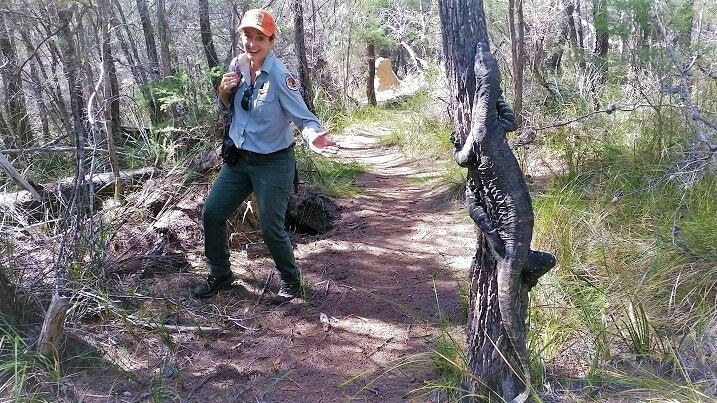 We certainly got a surprise when we ‘stumbled’ across this healthy lace monitor specimen while hiking into Bittangabee in the spectacular Ben Boyd National Park on the unspoilt Sapphire Coast of New South Wales! Luckily, we had the fearless park ranger Wendy with us, who rightly advised us to give it a wide berth. 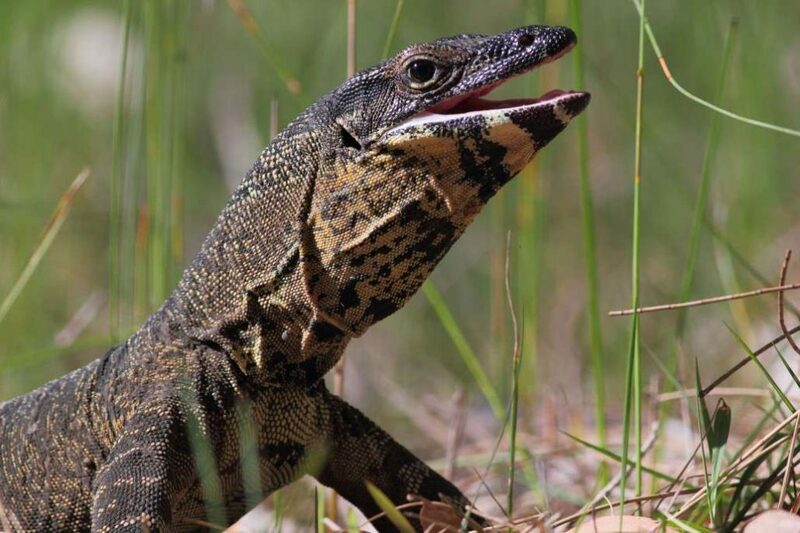 Goannas are carnivorous and have sharp teeth and claws, and recent studies have shown that they may be venomous, as opposed to their bites causing bacterial infection as previously thought. Also, if they are alarmed, they may mistake a human bystander for a tree and try to climb them to safety! Ouch! Goanna is the name given to any of a variety of monitor lizards of the genus Varanus, found in Australia and south east Asia. There are about 20 species of monitor lizards, and 15 are endemic to Australia. The lace monitor pictured (Varanus varius) is common to forested areas of eastern Australia, and though often seen on the ground, they spend a lot of time sheltering in trees. It is the second largest Australian goanna and can grow to over two metres. They feed on anything from insects, birds and eggs, to snakes and carrion. The female digs a hole in the side of a termite mound to lay her eggs inside and then allows the termites to seal up the mound, keeping the eggs incubated at a constant 30 degrees celsius. She knows when the eggs are due to hatch 8 – 9 months later and returns to the mound to dig the baby goannas out! One thing that we DO know for sure is that the lace monitor is not endangered, and we see them often during our adventures on the beautiful south east coast of NSW. 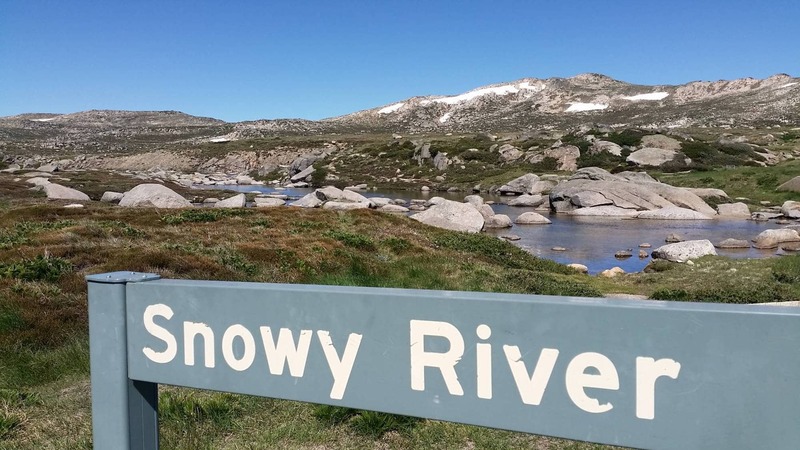 So why not check out our fabulous 4 day, 3 night Sapphire Coast tour, and have a relaxing getaway in this undiscovered paradise?! © 2019 Gang Gang Tours.